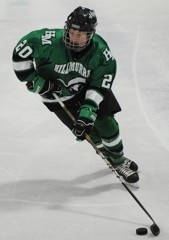 Hill-Murray has nine seniors on its squad this year: Ben Bahe, Kevin Becker, Bob Bruski, J.D. Cotroneo, Loren French, Ryan Holler, John Phillippi, Kevin Schulze and Tim Shaughnessy. Looking at the statistics, it’s easy to see the talent those nine seniors bring to the Pioneers. Together they combined for 8 points (3 goals, 5 assists) and 9 saves during the Tuesday, Jan. 18, 6-1 victory over Holy Angels. It has been the impressive play by underclassmen, however, that has created excitement around the Pioneers. 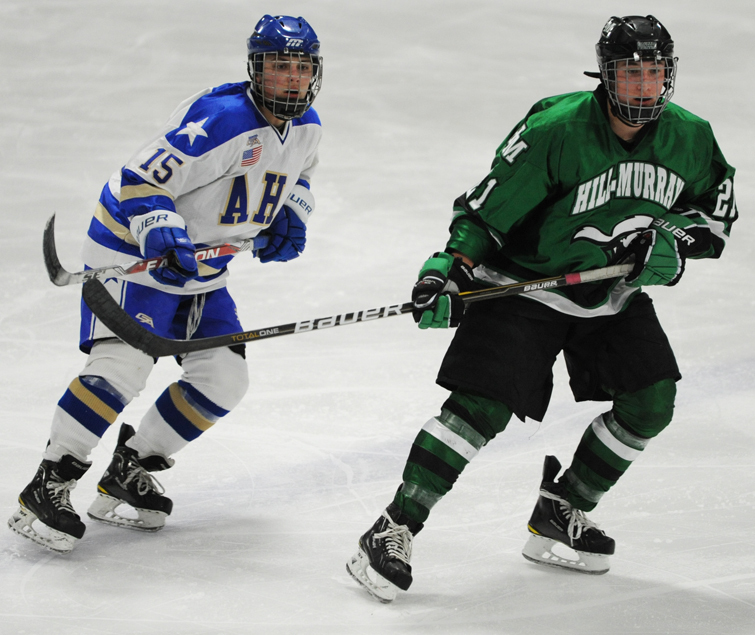 Sophomores Jake Guentzel (14 points – 6 goals, 8 assists) and Zach LaValle (17 points – 11 goals, 6 assists) have been strong contributors to Hill-Murray’s offense. 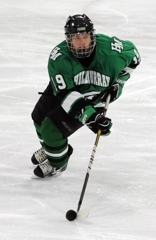 “They're doing great and we also have Luke Voltin who's a sophomore and big, strong kid,” Hill-Murray coach Bill Lechner said. “They have great futures ahead of them. Our JV is doing well. Every year we purposely make our JV full of freshmen and sophomores knowing they'll be competing against older teams. 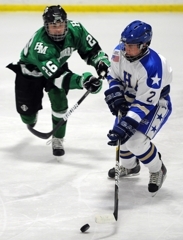 Part of that flow involves skating younger players with the older ones. 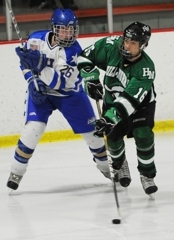 LaValle found himself playing with Holler and Voltin during the Jan. 18 game against Holy Angels. 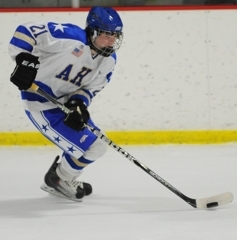 The line scored the first two goals of the game and combined for 6 points (2 goals, 4 assists). “Voltin got that pass from Holler and he came into the zone and I was wide open in the slot and he gave it to me. 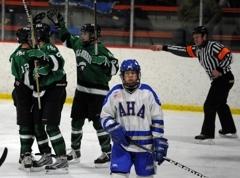 It was a nice feed and I just put it home,” LaValle said about his first goal. Lechner is starting to get more comfortable with what he is seeing each night. 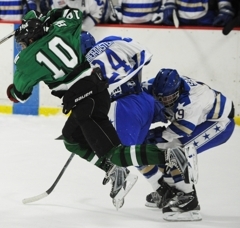 “Like we told the guys, you don't want to be over-confident in January,” Lechner said. “We're starting to gel. We're getting some nice combinations. We're starting to like each other and believe in each other. We're moving the puck well and trust our systems. Different lines, different point in the season, different team. 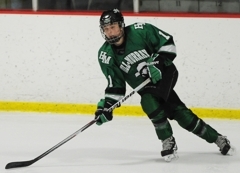 Hill-Murray is orchestrating an impressive comeback after a shaky start to its year, including a 6-1 victory over Holy Angels on Tuesday, Jan. 18. 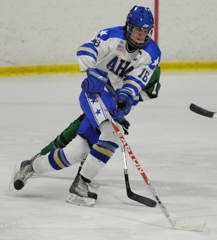 Lechner utilized new lines splitting up the Pioneers’ top three scorers – Ben Bahe (25 points: 16 goals, 9 assists), Kevin Becker (20 points: 9 goals, 11 assists) and Zach LaValle (17 points: 11 goals, 6 assists) – and skating them on separate lines. “We've moved the lines around three or four times in the last month and we're getting close,” Lechner said. “We're mixing and matching with guys that like each other and with different age groups. 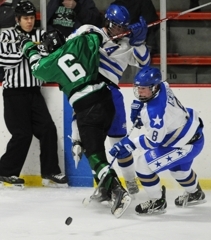 Six Pioneers scored during the 6-1 winning effort over Holy Angels. “We've been switching it up,” LaValle said. “It happens every year - if something doesn't work we change it up. Right now I think we got it going. 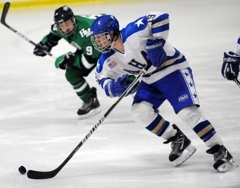 Losing two out of the first three games of the season was not what Lechner and the Pioneers had in mind, but they have used the rough start as motivation. “We divide the season into four chapters, so to speak,” Lechner said. “The first chapter is before the Christmas tournament. We say we're not going to be perfect and we're probably not go undefeated. We've done that in the past and we couldn't hang on to it. We got to state and we had nothing left. Now, the Pioneers will work on keeping it together. “We had good games this month and we're just hoping to keep it going,” LaValle said. 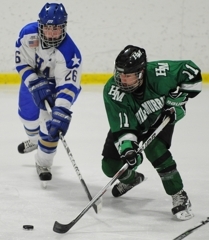 Six Pioneers scored and Hill-Murray's defense only allowed 10 shots on goal during the 6-1 victory over Holy Angels. Zach LaValle and Ryan Holler scored the game's first two goals and each registered a goal and an assist. 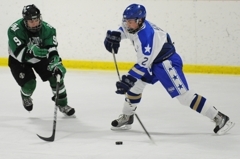 Luke Voltin and Kevin Schulze each provided two assists. 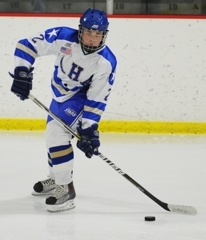 After jumping to a 2-0 lead in the first period, the Pioneers kept firing shots on Holy Angels' goaltender Brett Pierce and found scoring in each period. 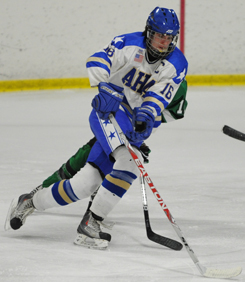 Holy Angels had a tough time finding any scoring chances and only managed to put one shot past Hill-Murray's goaltender Tim Shaughnessy on a goal by Mario Bianchi. 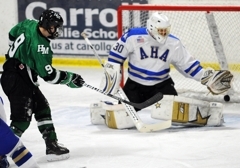 Pierce made 25 saves on the Pioneers' 31 shots. 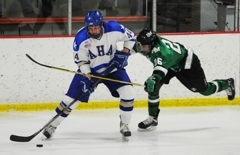 Up next for the Pioneers is a Classic Suburban conference game when they host Henry Sibley at Aldrich Arena on Saturday, Jan. 22, at 8 p.m.
Holy Angels will travel to Eden Prairie on Thursday, Jan. 20, at 7:30 p.m. to take on the third-ranked Eagles. 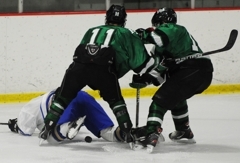 The sophomore forward started the game on a high note scoring a quick goal 1:11 into the first period. LaValle would also register an assist on Ryan Holler's goal just under 10 minutes later. LaValle's play in the first period stood out on his line with Holler and Luke Voltin and set the tone for the rest of the game. 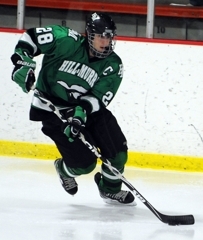 Holler assisted on LaValle's first period goal and added his own 10 minutes later into the period. 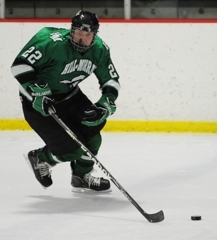 As a senior, Holler is the oldest Pioneer on his line with LaValle and Voltin (both sophomores) - the line that provided the game's first two goals. Holler's leadership as a senior and co-captain was apparent. 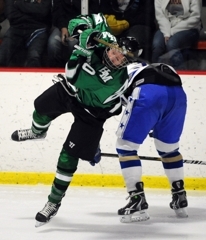 The senior forward was the definition of determination during the 6-1 loss. 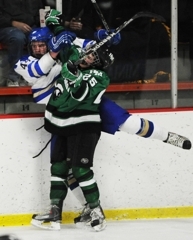 Despite the game's result for his team, LaBate played great hockey at both ends of the ice. 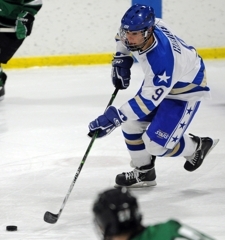 Although his effort did not lead to many scoring chances, he did provide an assist on the Stars' lone goal.